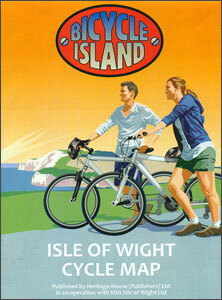 Isle of Wight on a cycling map at 1:46,500 from Heritage House, highlighting three longer and 12 shorter recommended routes, plus lists of cycle-friendly accommodation, and bike shops and services. The map prominently highlights three longer ‘round the island’ routes: a 51km/32 miles Red Squirrel Trail, an 80km/50 miles Chalk Ridge Extreme route, plus a 100km/66 miles Taste Round the Island route. Each one has on the reverse a description plus a route profile. Also marked are 12 shorter rides between 8km/5 miles and 18km/16 miles long; each has a brief description plus grading. 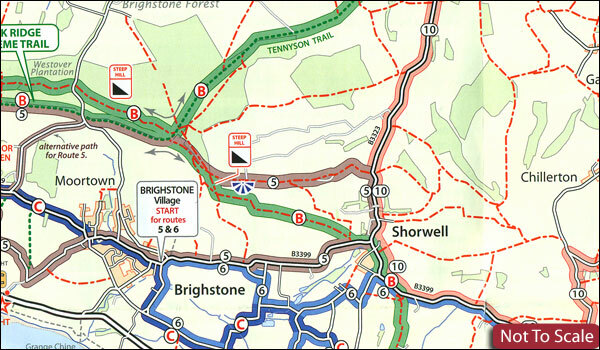 The map also shows byways open to all traffic and public bridleways. Symbols indicate danger points along the highlighted routes, recommended accommodation, campsites and caravan parks, cycle hire and shops, power bike charging points, pubs, various tourist attractions, etc. Woodlands are marked in colour but otherwise there is no topographic information. The map has no geographical coordinates. Basic street plan show recommended routes across Cowes, Sandown and Freshwater. Also provided are contact details for recommended cycle-friendly accommodation, plus lists of bike shops and services.